The bustling suburb of Mascot is close to the city centre. It’s a good base for a transit stopover, with great accommodations, shopping, delicious restaurants…and it takes a lot of power to keep all those businesses running safely and smoothly. Listed below are just a few of the ways that the friendly and knowledgeable staff at Randwick Electrical help to keep Mascot powered. For optimum smoke detection, smoke alarms should be installed in every room, living area and hallway of your residence or business in Mascot. This is very important where occupants sleep or work with a closed door. Smoke alarms cannot detect smoke through a closed door. Research shows that people are more likely to react to an alarm that is located within their room of occupancy. In multi-level buildings, we recommend additional smoke alarms are installed in the path of travel between each level. Hotels conference rooms are rented out as venues for large groups to commune. Likewise, boardrooms and offices spaces play host to conferences and seminars. Many of the groups draw distinguished guests. But if your audio/visual equipment isn’t working, attendees may be disappointed by the entire event! Avoid this situation and upgrade your audio/visual equipment at a reasonable price with Randwick Electrical services. 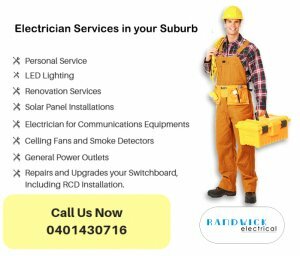 Have Randwick Electrical as your electricians in Mascot on speed-dial for around the clock emergency electrical service.